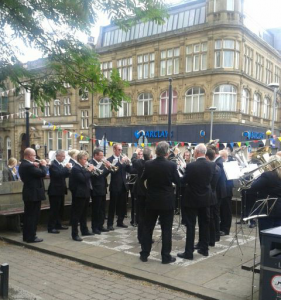 The Skelmanthorpe Band claimed the honours at Morley on 16th June 2013. There was an excellent turn out of competitors at the popular Morley March and Hymn Tune Contest and we had a head to head battle with our Yorkshire Championship Section rivals Marsden Silver for the £500 first prize. We overturned a one point deficit from our march performance of ‘The President’ into an overall one point winning margin thanks to a fine rendition of the hymn tune ‘Praise My Soul’, which also gained us an extra £60 in prize money. MD John Roberts said the decision to enter the contest for the first time had paid off in fine style for the band. Watch our march on Youtube.